"Cute” is obviously the first word that comes to mind when describing Totoro, the star of director Hayao Miyazaki’s 1988 anime classic "My Neighbor Totoro." “Unhurried” would also be a pretty good choice, though. Not only is the furry Studio Ghibli mascot unflappably relaxed, he’s taken 30 years to make his way to theaters in China. This month, though, "My Neighbor Totoro" will become the first Studio Ghibli film to have a theatrical release in the country, with a digitally remastered version of the film set to premiere on Dec 14. 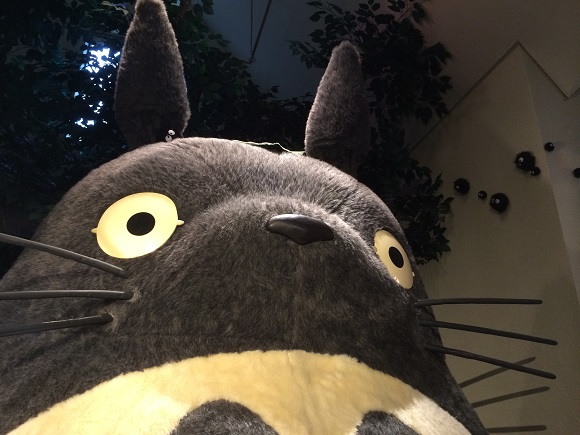 But even though no Ghibli films have officially screened in Chinese theaters until now, Totoro is already much loved in China, thanks to alternative media distribution methods. As such, the movie’s opening is a big deal, and to celebrate, the local marketing team has commissioned a gorgeous new poster. For those who aren’t familiar with the story, "My Neighbor Totoro" focuses on two young sisters, Mei and Satsuki, who move to a countryside home with their father, where they encounter various nature spirits while exploring the surrounding forests and fields. The Chinese poster, with Miyazaki’s name displayed proudly smack dab in the center, is beautifully understated in its aesthetics, showing Satsuki following Mei through what appears to be a field of tall grass. The perspective, gazing down on the girls from far above, elegantly reminds us of how young and full of potential they are by drawing the characters as such small representations, with so much of the wide, wonderful world waiting in front of them. But then, as your eyes follow in the direction of Mei’s outstretched hand, you notice a few darker patches. Are these metaphors for the sadness and hardships that are also part of growing up? Shadow cast by clouds, further reinforcing the atmosphere of watching the scene from above? Perhaps, but the more likely explanation is that they’re the gray tufts of fur on Totoro’s eminently huggable tummy. The clever design, subtle enough that you might miss it at first glance but distinctive enough that you’ll always notice it after, is the work of Chinese artist Huang Hai. 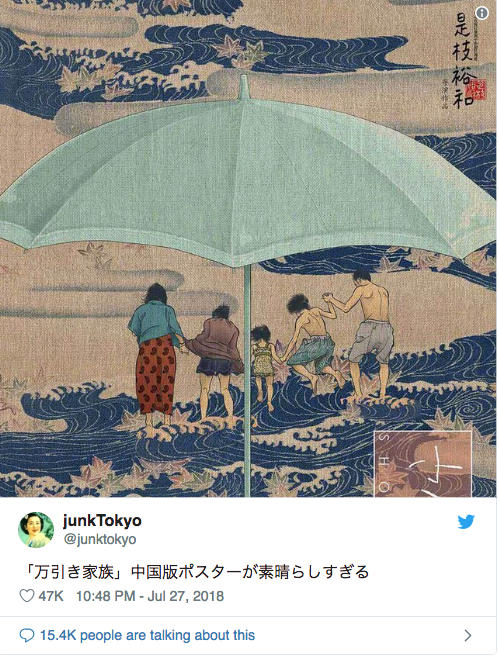 His take on Totoro has been drawing praise both in China and Japan, and is so artistic that one commenter sees parallels with The Ball, one of the works of 18th/19th century Swiss/French painter Felix Vallotton. This isn’t Huang Hai’s first time to work with a high-profile Japanese film. He’s also done local posters for "Shoplifters" (also known as "Manbiki Kazoku"), a live-action Japanese movie released earlier this year, and the 2014 CG "Stand By Me Doremon" film. 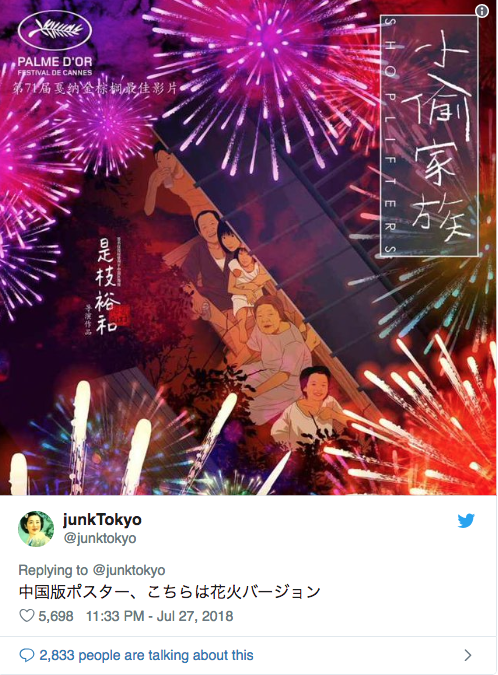 As mentioned above, "My Neighbor Totoro" is the first Ghibli film to have a theatrical release in China, but if it does well at the box office, we can probably expect to see some of the studio’s 20 other films get a similar treatment, and hopefully similarly beautiful posters. Art, historically, always eclipses politics. Nice images. I particularly like the first one for Shoplifters. Really good blend of traditional and modern. Have to say, though, I think the writer's over-reaching a bit with the "metaphors for sadness and hardship" stuff. No mention of why the mother is not with them though, which could account for some of the sadness mentioned. 'Theatrical' in the title made me think they were putting on a theatrical, er, stage play of Totoro.